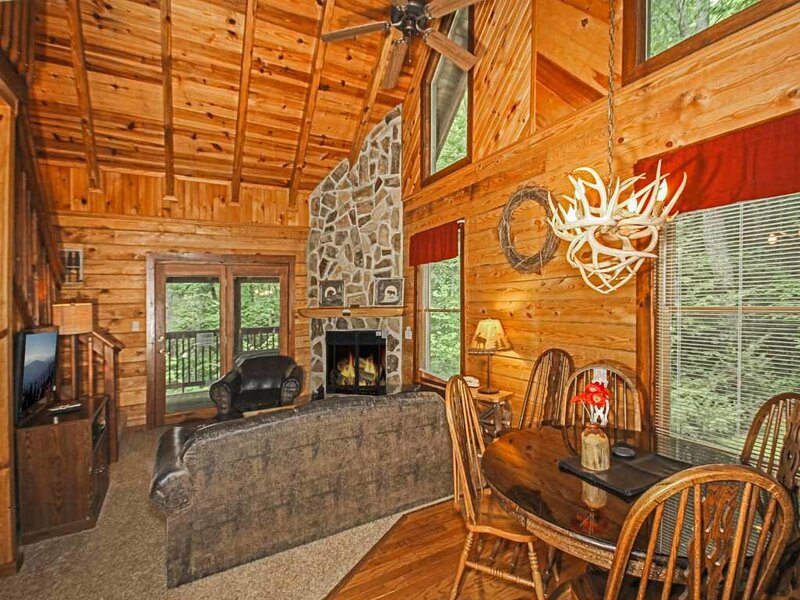 If you're a nature lover, Gatlinburg might be the perfect place for you. 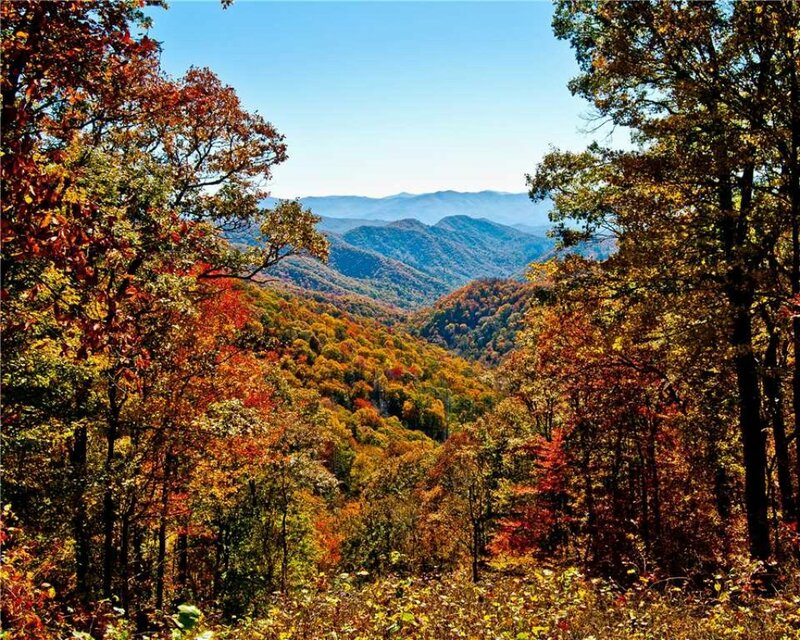 The Great Smoky Mountains are right next door, and their spectacular views, rich wildlife, and long hiking trails are all but guaranteed to leave you speechless. 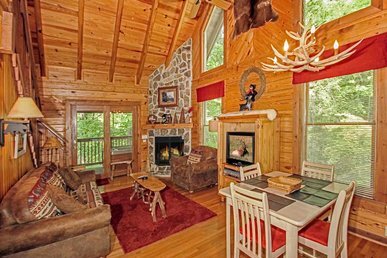 Gatlinburg itself is filled with fun places to visit, such as Ripley's Aquarium or Odditorium, the Sky Lift, and the many shopping malls and museums. 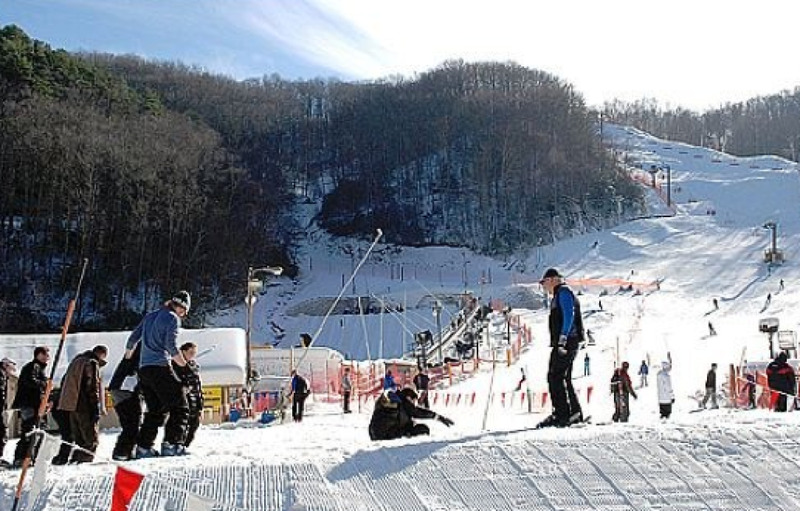 During the winter season, the Ober Gatlinburg Amusement Park and Ski Area is a must visit for anyone interested in ski sports. 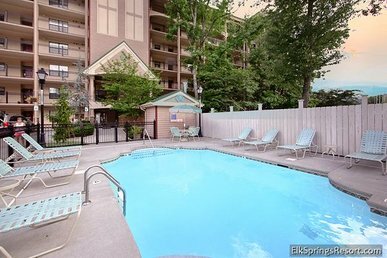 But with so many rental units in the area, finding the right one can be a long and arduous process. 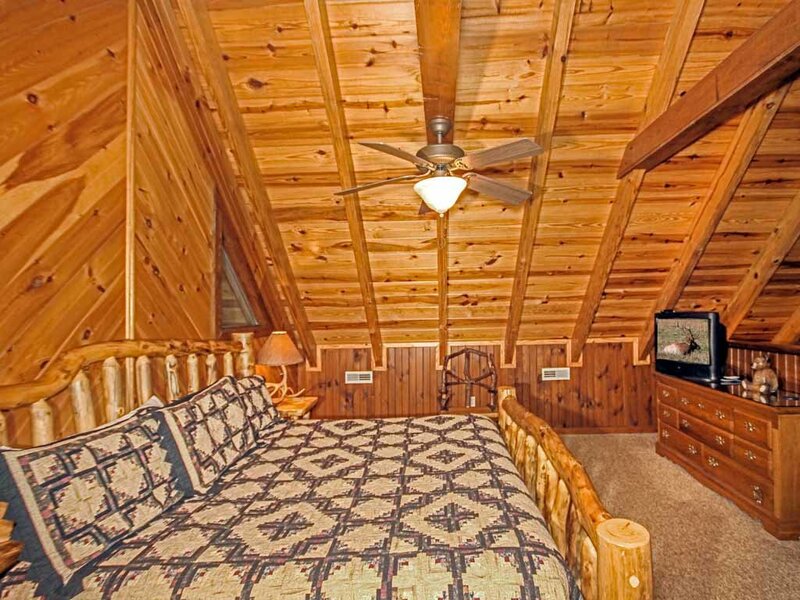 Fret not – we're here to help you out! 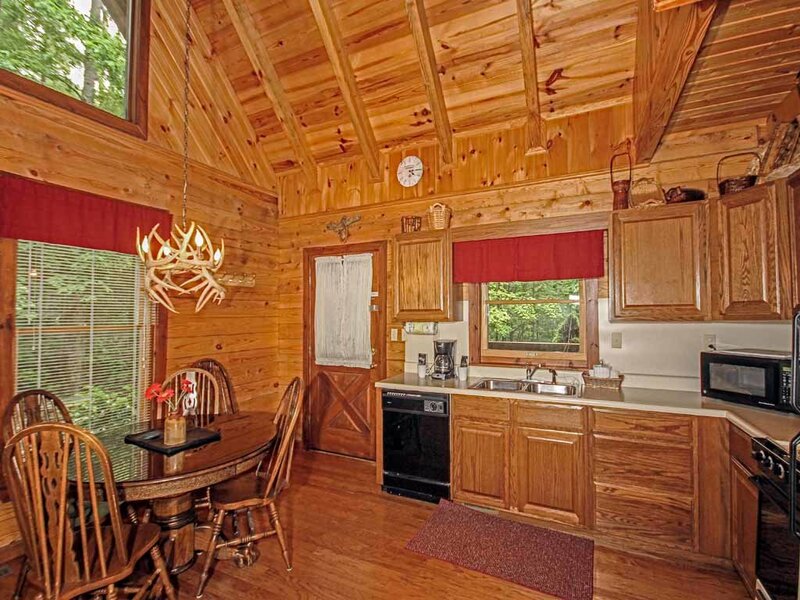 The Doe's Den is a centrally located cabin that provides both rustic charm and an impressive view of the mountains. 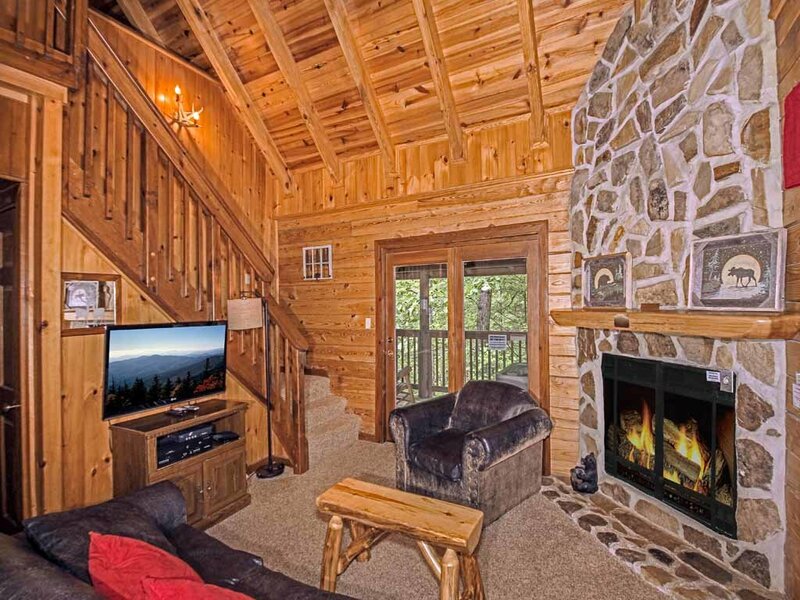 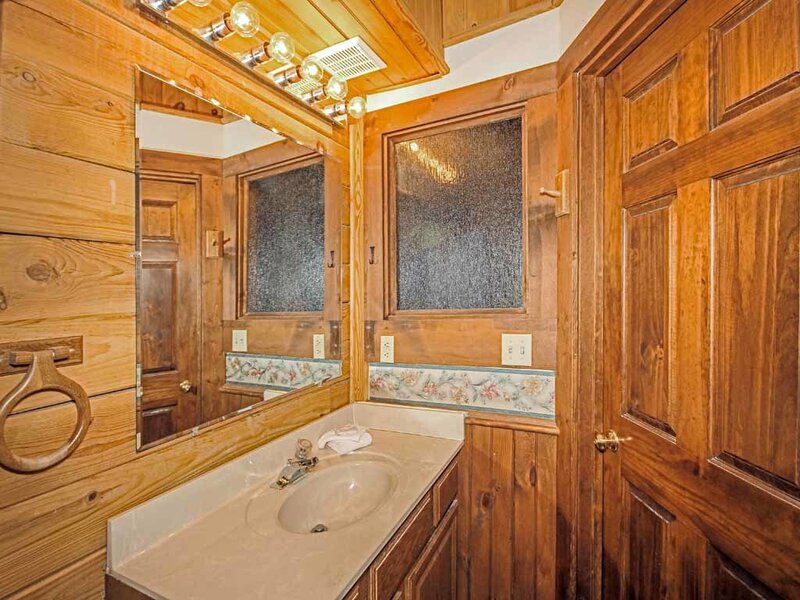 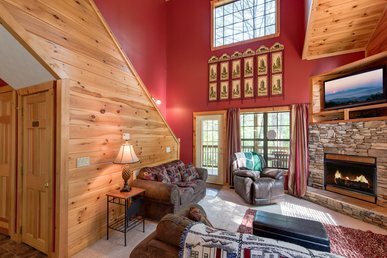 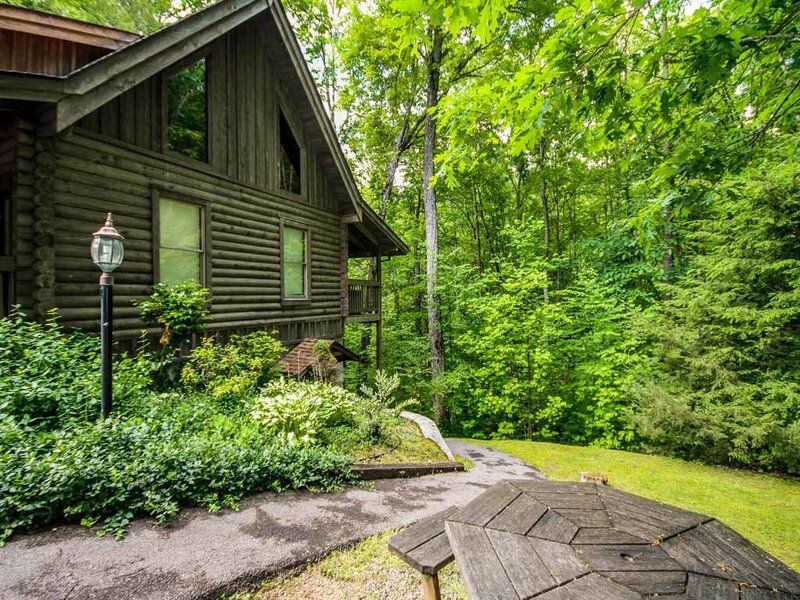 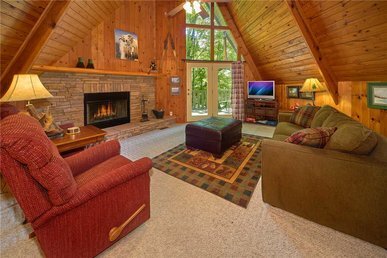 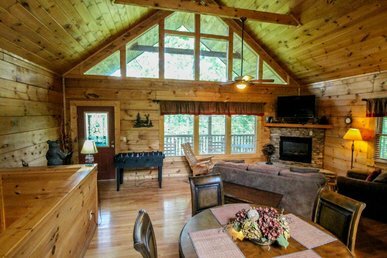 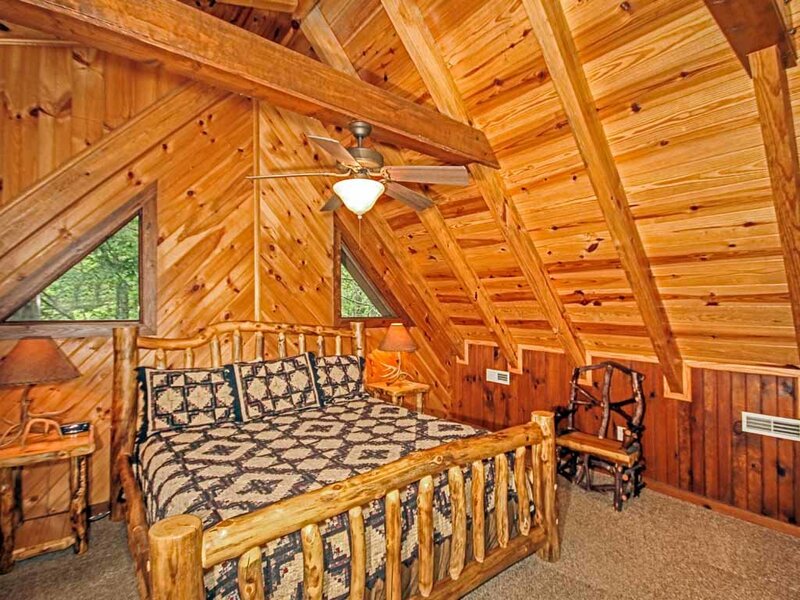 Despite being secluded enough to offer privacy to its visitors, the cabin is only a short drive away from downtown Gatlinburg. 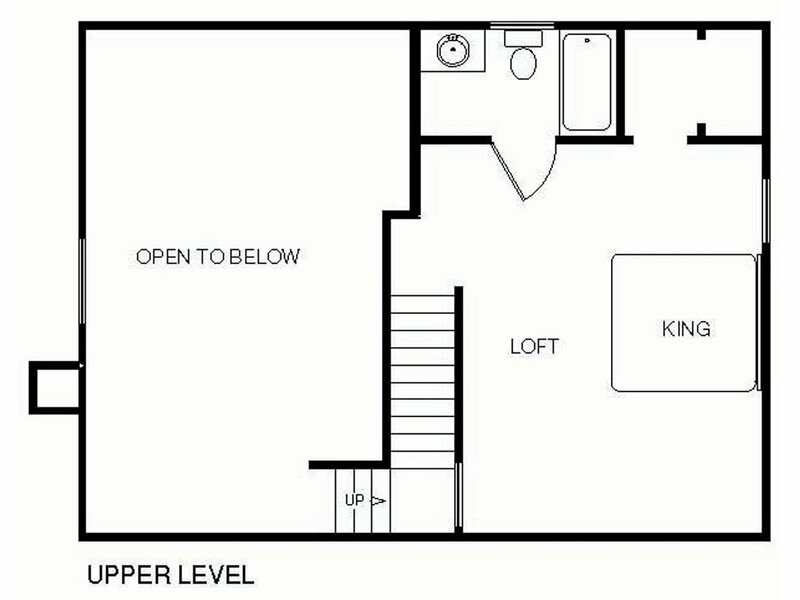 If you discover you've forgotten to pack certain items, this is a convenient 'get out of jail' card. 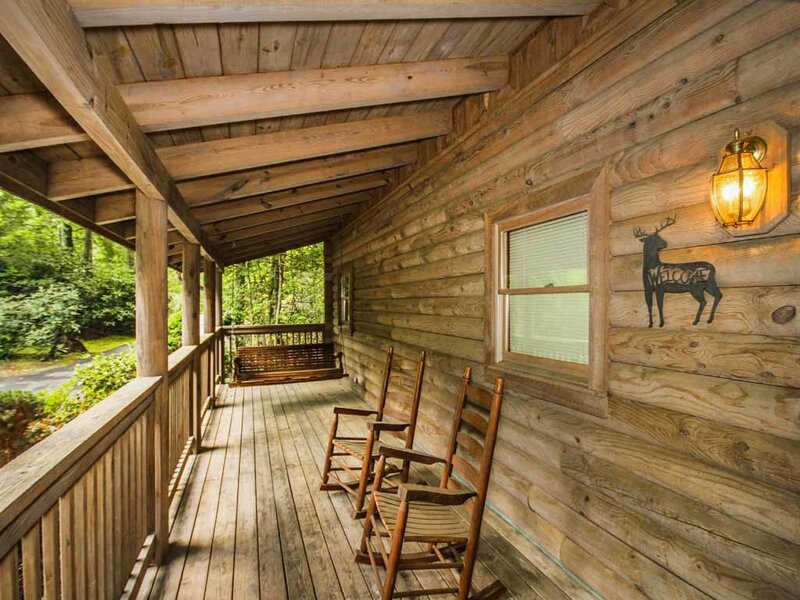 This picturesque cabin is mostly defined by its vintage charm. 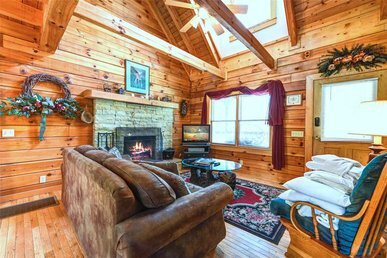 With its cozy atmosphere, lovely woodwork and exquisitely carved furniture, Doe's Den exudes old-fashioned elegance and style. 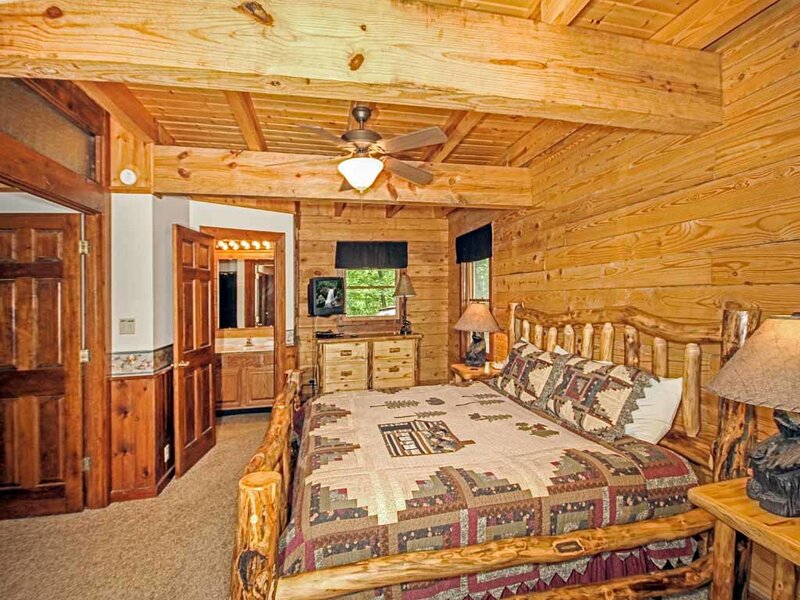 Just as importantly, the cabin is quite comfortable as well. 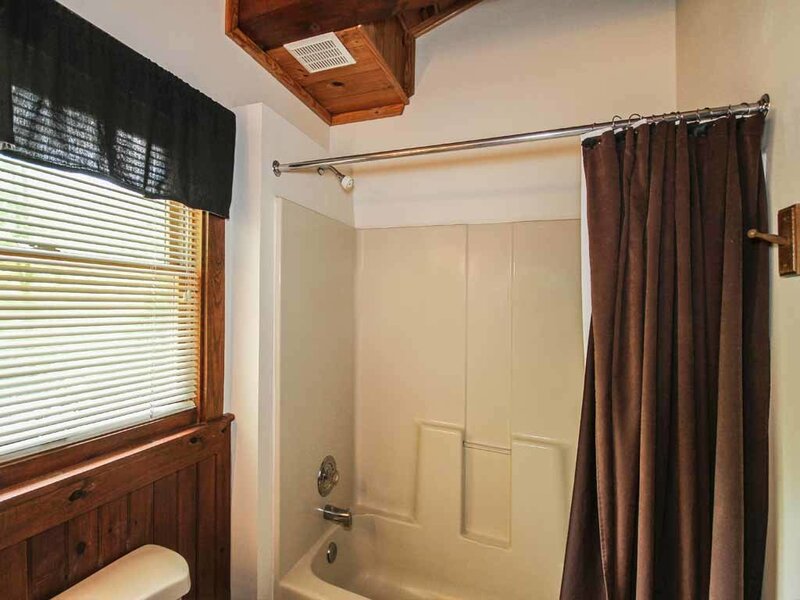 Once you arrive at the Doe's Den, fresh towels and clean bath linens will already be waiting for you. 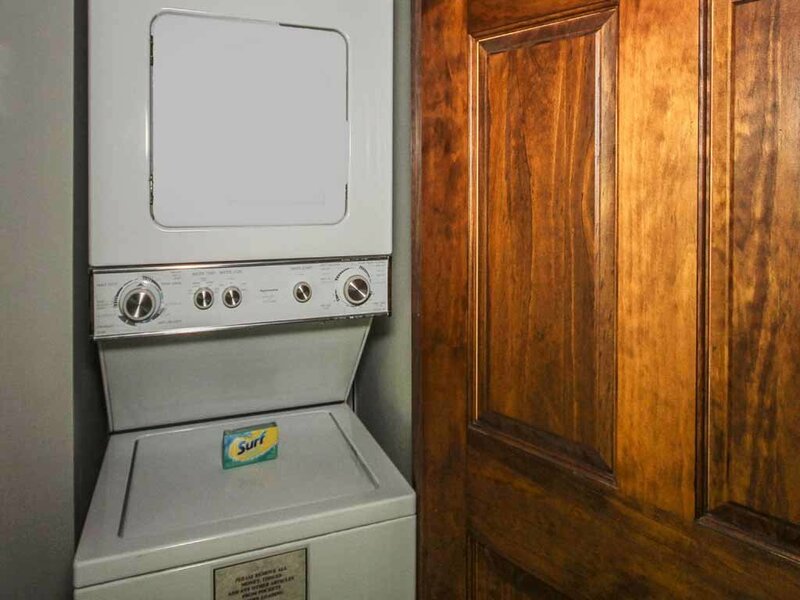 The cabin also features a washer and dryer, so there's no need to pack that many clothes. 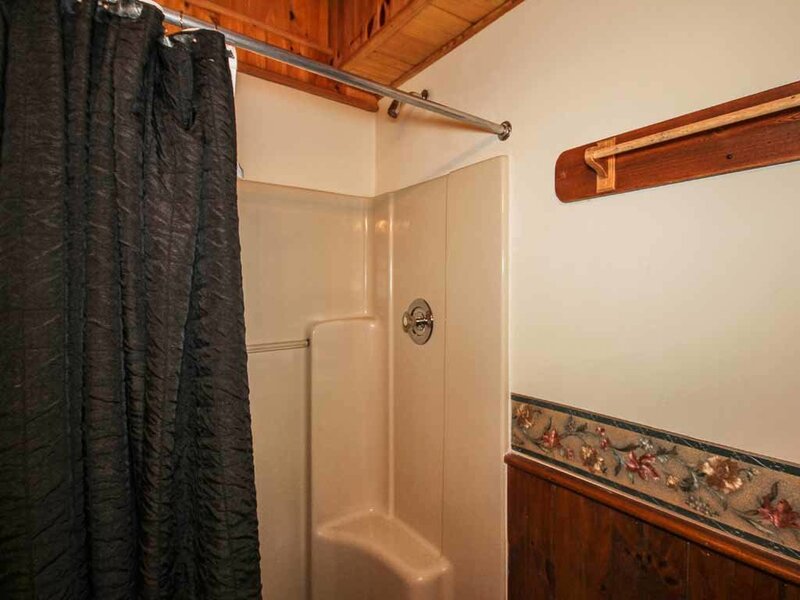 Once you've finished with your shower, you'll probably want to head straight to bed. 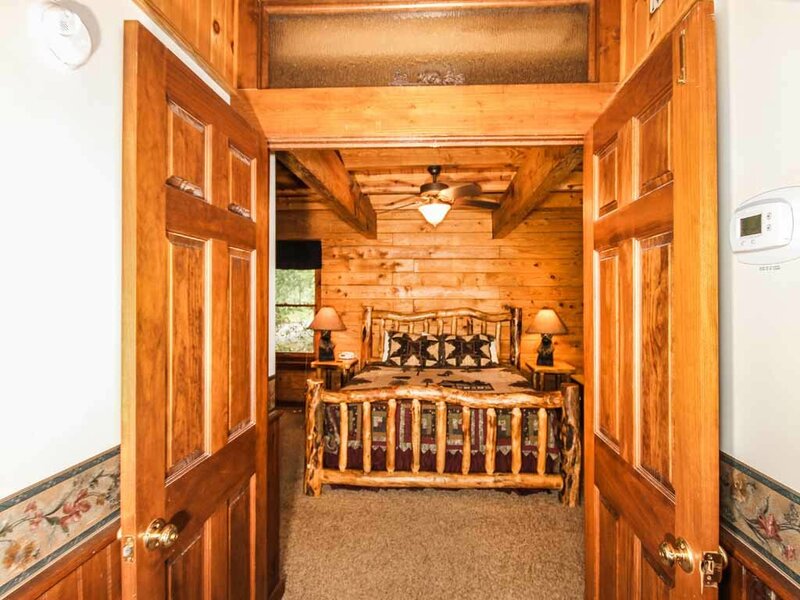 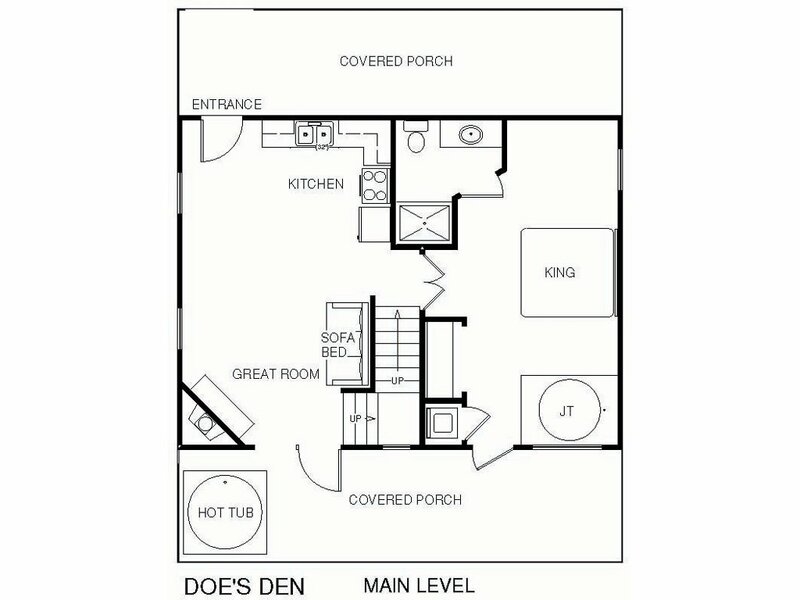 The two king size bedroom suites are doubtlessly the heart and soul of the Doe's Den, and the beds are so cozy that you'll have to force yourself to get up early. 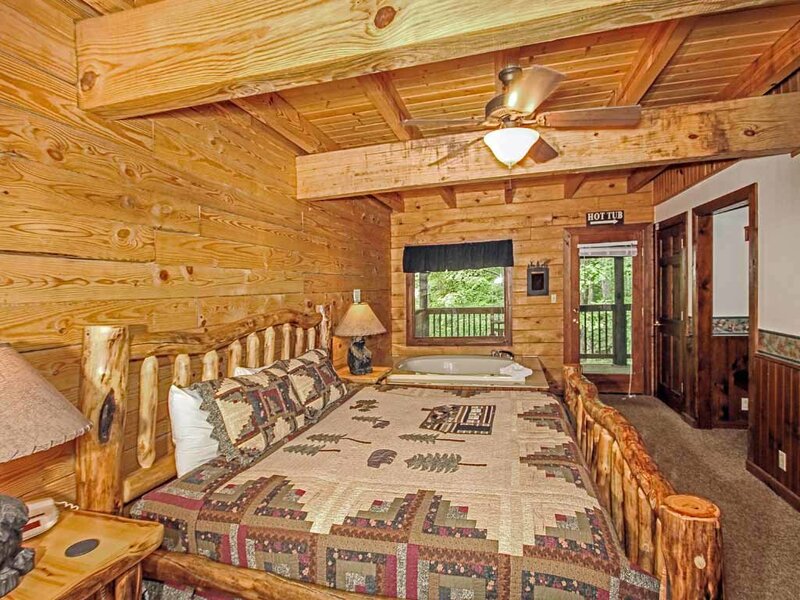 There's enough sleeping space for six people, so you can bring your family and friends along with you. 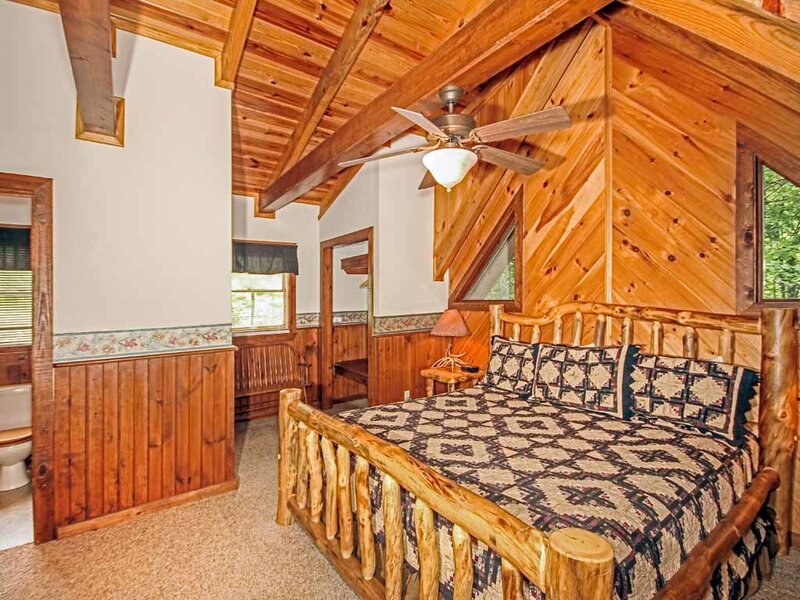 The main level bedroom contains a jetted tub with a forest view – perfect for those who just want to unwind a bit after a long day of mountain trekking! 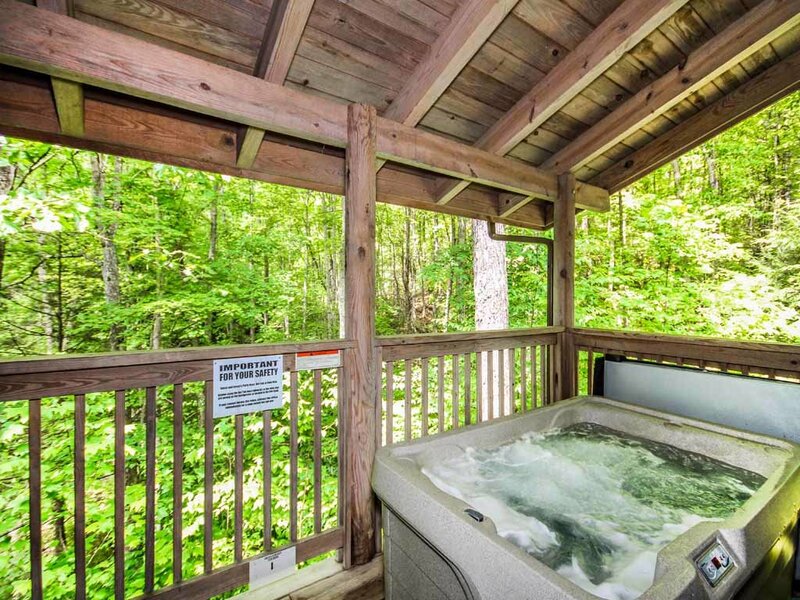 Speaking of places to unwind, the Doe's Den also has an outdoor hot tub on one of the two covered porches. 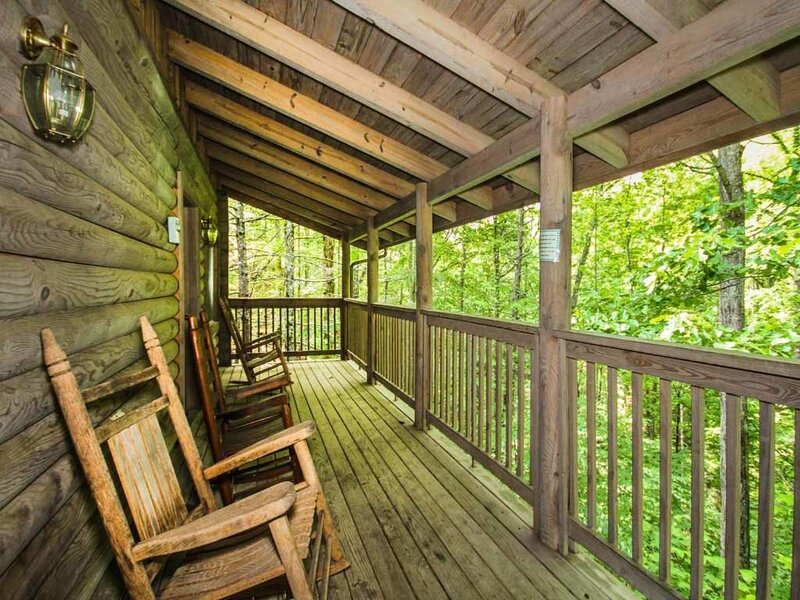 And if you just want to enjoy the nature view without dipping your toes in the water, rocking chairs and/or a porch swing make for a quaint and relaxed afternoon. 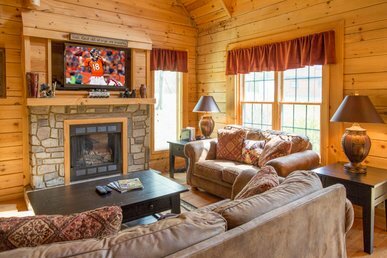 The living room is yet another excellent option to spend a couple of quiet hours, thanks to its big fireplace and a flat screen TV. 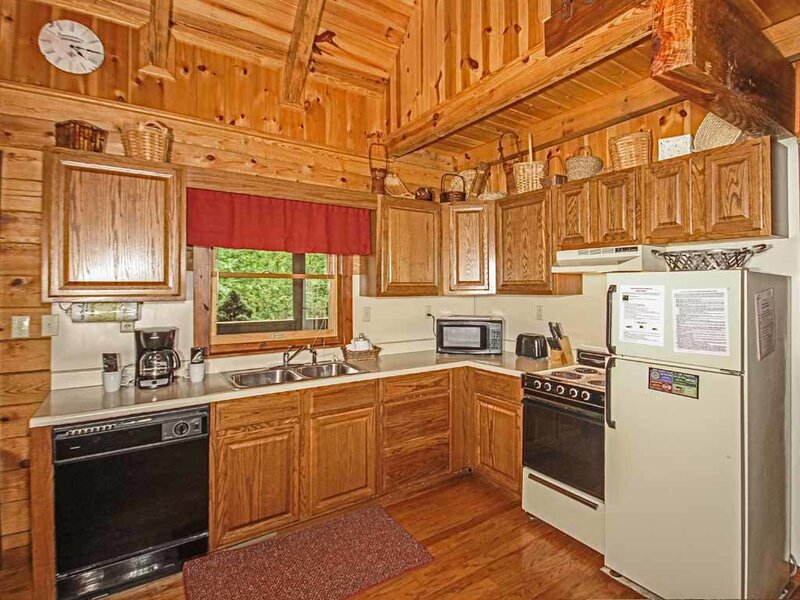 The cabin's rustic yet modern kitchen contains everything you need to cook up a storm. 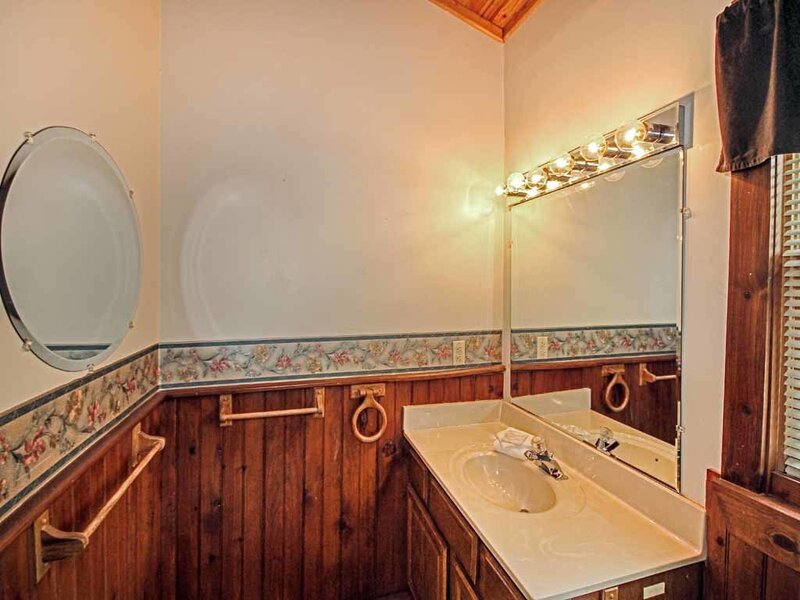 The tools and dishes are already there, so you just have to worry about the groceries! 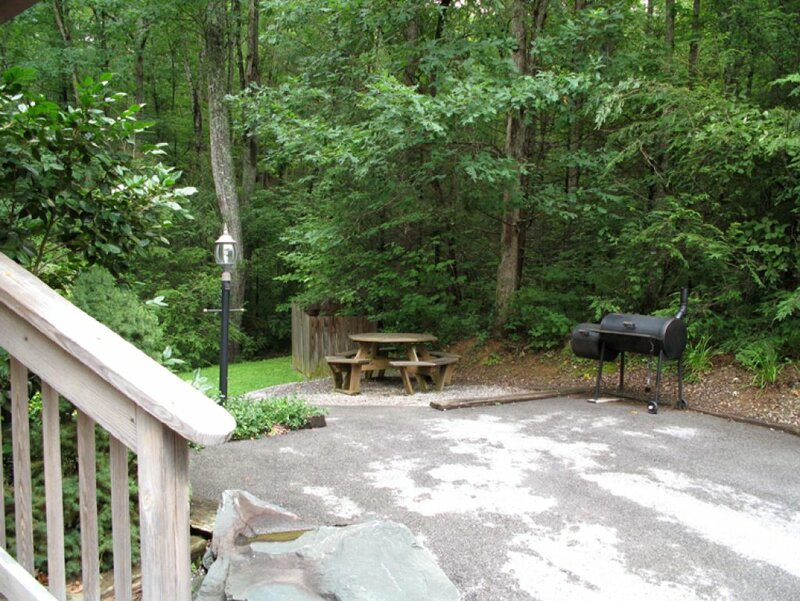 The outdoor eating types will probably be glad to see the charcoal grill in the backyard. 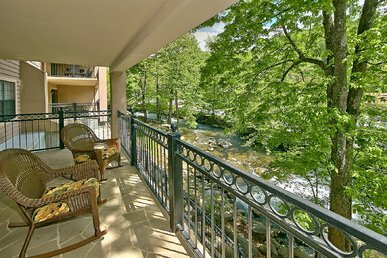 And if you don't like the idea of cooking on vacation, downtown Gatlinburg has plenty of fine dining restaurants for any taste. 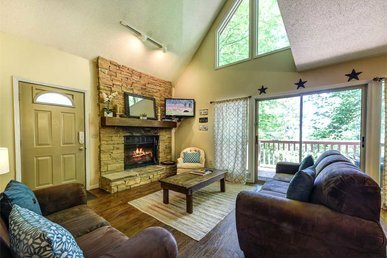 At the Doe's Den, you can all make some new memories together. 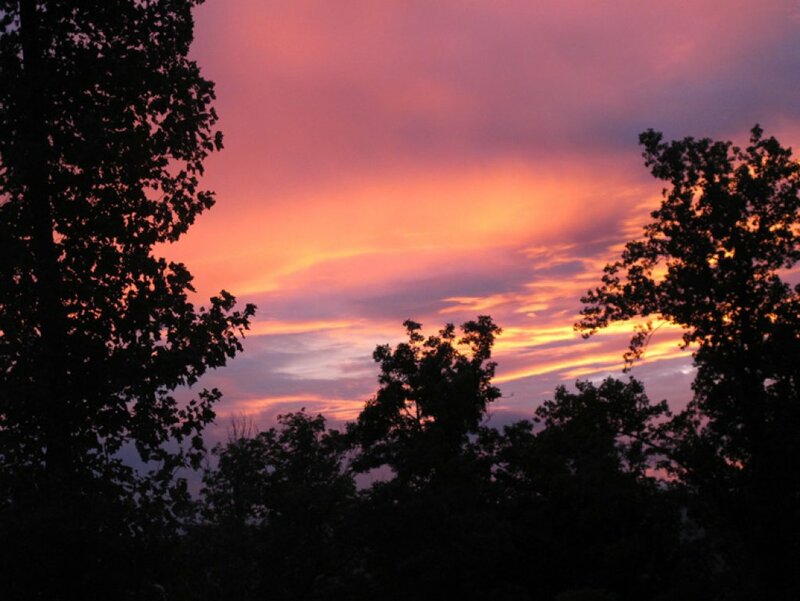 Nature has rarely been this approachable! 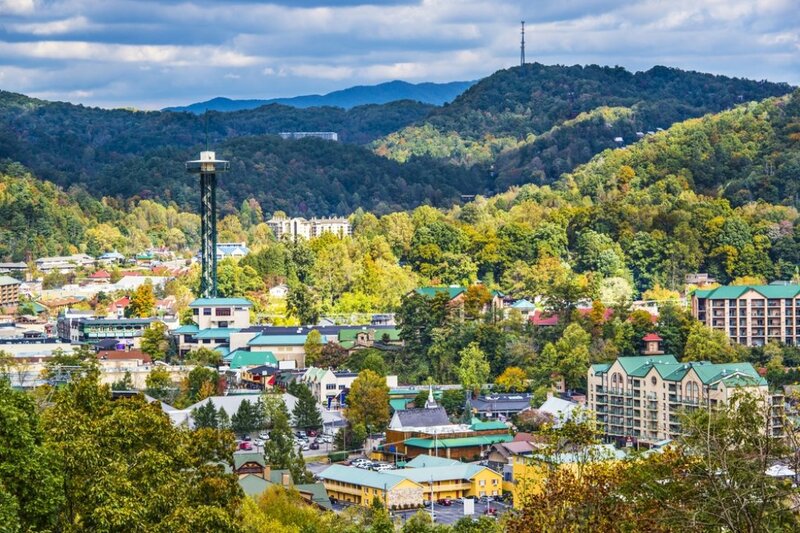 Gatlinburg and the Great Smoky Mountains with over 900 miles of hiking trails are close by so make sure you plan some time to take a stroll through downtown Gatlinburg. 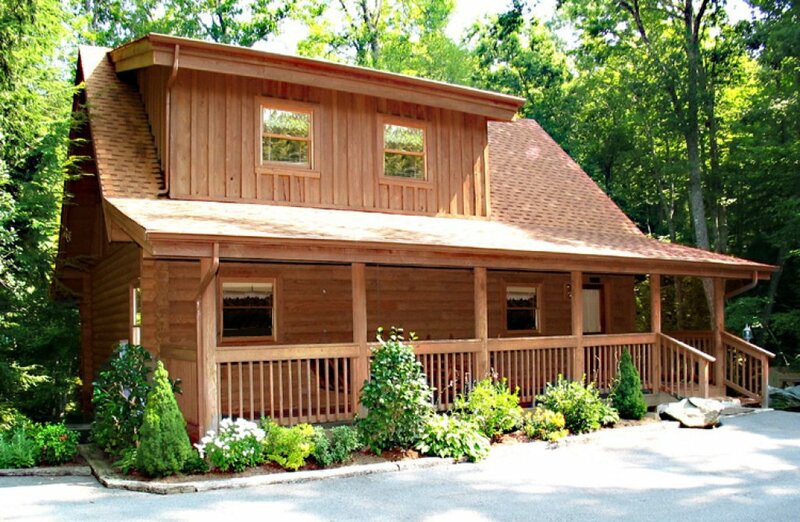 You will not want to miss Ober Gatlinburg, Pigeon Forge, Cades Cove, or our many shopping malls. 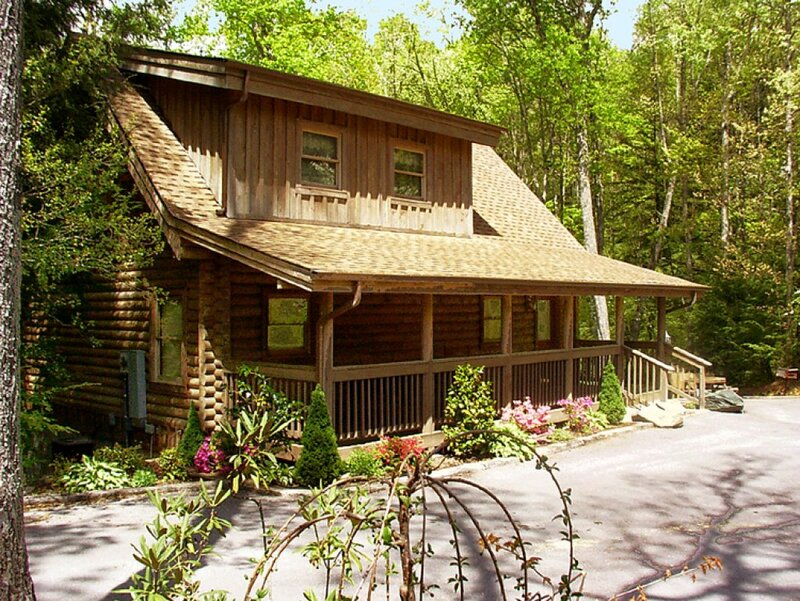 You will never run out of things to do here. 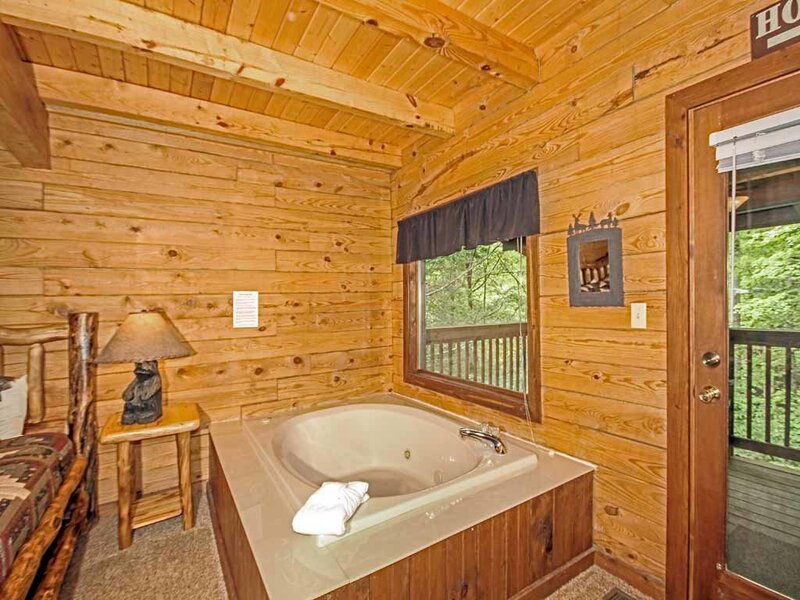 Since there is a private hot tub, bring your bathing suit and spend the day just relaxing. 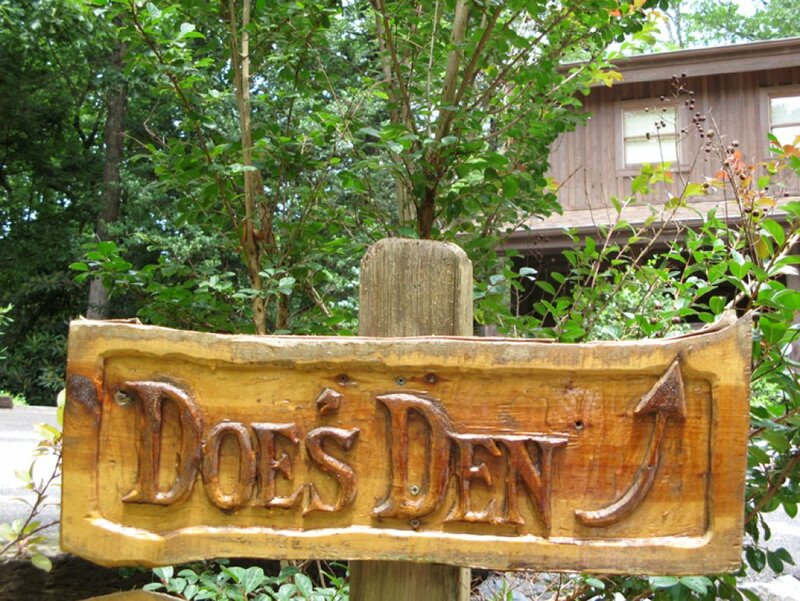 Whatever you decide to do in the area, Doe’s Den will be welcoming you back for the most relaxing vacation experience every! 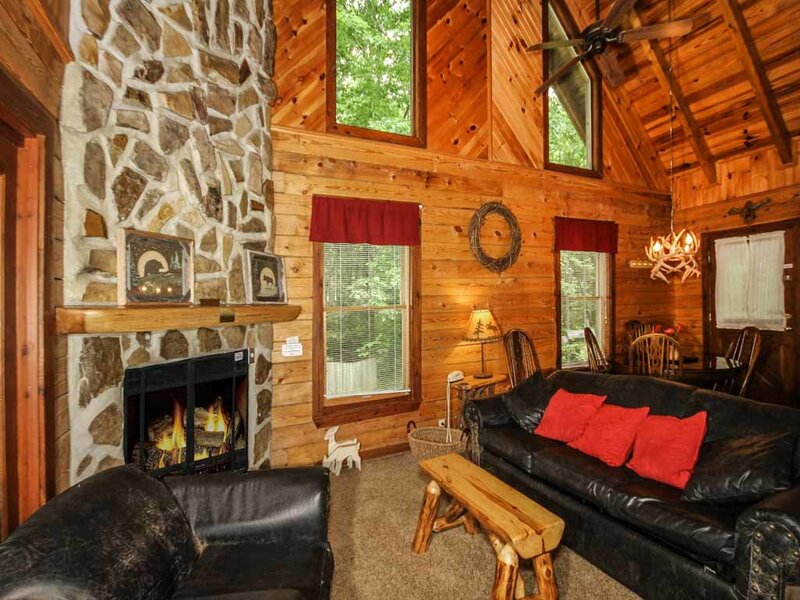 Book Doe’s Den now if you are ready to get back to nature and make some new memories.